"For what is a man profited, if he shall gain the whole world, and lose his own soul? or what shall a man give in exchange for his soul?" What a year it has been in our family! At the beginning of the year we moved at last from our temporary accommodation to a brand new house. We knew amazing comparisons when we moved back then. Our new home was warm and cosy with plenty of space to move around. We enjoyed all-sorts of mod cons which were somewhat of a novelty back then :-) A beautiful large bathroom and kitchen, a downstairs cloakroom, and plenty of electrical sockets everywhere! We felt thoroughly spoiled. It was as if we were on a long self catering holiday! I used to roam from room to room admiring the decor and view but always had that feeling that we would not be there permanently. I felt that we had been posted there for a while to take care of it for the next occupants. We had a nice size garden and worked hard in it to make it tidy and inviting and I was rather looking forward to encouraging the little birds in the neighbourhood to come and feed from our bird table. However this was not to be; for our family circumstances were about to change once again as our Son was to be married later on in the year which would mean that the two of us would end up occupying a house designed for a family. (Living in rented accommodation leaves us a little vulnerable at times!) A flat had become available just before our Son's marriage and we were tentatively approached about moving once again! We were able to keep the keys to the flat until after the date of the big day and then move in afterwards. This for us was ideal because we were able to use our large home to accommodate all things to do with weddings and all the family and friends coming and going while being able to decorate our flat and move a few of our things over at the same time. Because our flat was only a couple of minutes walk away I was able walk many things over in boxes. The second phase of reconstruction work on our estate was well established during the interim period. Old houses were demolished and others were gutted to be refurbished. One morning we watched with interest our old temporary house being demolished which seemed to be strange as we witnessed the walls coming down as if they were made of cardboard. Those structures in which we once felt safe and protected were so flimsy and now reduced to large piles of rubble and dust. One of the lovely things about walking backwards and forwards between house and future home in our flat was that we stopped and talked with many of our neighbours and those living on the road to the flats. One lady said something which was of great interest to me. While we were talking together the subject about being thankful for what we have came up. She is living in an extremely substandard house and will be moving into a brand new house very soon now. But she looked at her three beautiful children and said to me: "As long as we have our family and good health we have all that we need. Look," she said gesturing to the large pile of rubble that was once our temporary home, "even the homes we live in are nothing more than bricks and mortar! They can be so easily reduced to something like that!" She had a point! It is a good thing to be thankful; for so many of us take what we have for granted. But there's more! Perhaps we all are guilty of heaping up for ourselves treasures we feel we cannot do without. Someone's treasure may be their car, another's may be their home, and another's is probably money! These are only tangible things that can easily be taken from us or reduced to rubble. We cannot take any of these things with us when it is our time to leave this life and go into the eternal realm. I would have to add to my friend's statement that: "As long as all is well with our soul. As long as the question of our personal sin has been addressed and freely forgiven, we have all that we need. We may or may not be blessed with all these added extras but if we do not have a right relationship with God we have nothing at all of any value. Yet another year has passed and we stand on the shore line of the great ocean of 2014. What does the year hold for us? What will we gain and what will we lose? Wouldn't it just be a wonderful thing if sometime very soon somebody reading this would come into the great blessing of being at peace with God? There is no greater treasure than to know for sure that your sin has been cleansed and you have a home in heaven to look forward to. There is no greater friend to have than the living Lord Jesus who took your place on the cross and paid your sin debt in full, and no greater assurance than knowing His promised presence with you daily. Perhaps we may have been careless with our lives up till today but we don't have to continue that way anymore. Be wise therefore and take stock. Remember your soul is priceless and because God values it highly you ought to as well. Like our old home was reduced to a pile of rubble, the same can happen to those things we treasure! Even our very lives are somewhat like houses that grow old and must give way to passing. But the question is where do we go afterwards? What an opportunity everyone has to avail themselves of the full and free Salvation that God offers freely; for there is so much to look forward to for the one who has fully trusted in God's lovely Son. Wouldn't this be a wonderful year, never to be forgotten if you were to understand what God's beloved Son has done just for you? Repent of the sin that has separated you from the One who wants to bless you beyond compare and trust in the living Lord Jesus who once died on a cross in your place. Make 2014 the beginning of a life God has planned for you; for that indeed is what true life is all about! You might want to know about what happened to our flat! Well we finally moved in a week after our Son was married in September. Although it is not as modern as the house we lived in for eight months it is none the less very homely, warm and cosy and has a fantastic view! I think we landed on our feet as they say but I would have to say we have been truly blessed and we have a lot to be thankful for. Wishing you all every blessing and love in our Lord's precious Name. "... He was come from God." More often than not the value of that which we possess, be it tangible or otherwise is in its source or origin. Let us for example think of an heirloom. It might not be of any particular value to anyone else but because the item belonged to someone you loved it is of sentimental value to you. A word of wisdom may be much appreciated because of your admiration of the person who passed it on to you. A location may be more significant because of who was there before or what took place there in the past. Long ago, a Saviour was sent to this world to answer the greatest need of humankind. The dilemma sin had caused could only be solved by God Himself. Being unable to do anything about this great dilemma has left us in a helpless situation but thankfully God has come to the rescue! The Saviour the world was so much in need of was sent by God Himself. And how thankful we ought to be that He when God sent this Saviour, He sent none other than His only beloved Son. He could have sent an archangel but this would not do; for only His dear Son was able to do all that was required to reconcile lost sinners to Himself. And here we are today, possibly living in the eternal good of all that He has brought us into, depending on whether or not you have repented of your sin and trusted in Him with all your heart as the Bible commands us to do. But let us look at what the Saviour left behind when He came. He came from the realms of unapproachable light to first appear on the dark side of this little planet called earth. He came from the glories and spender of His Father's presence into the care and keeping of a lowly couple from the despised little town of Nazareth. He came from the presence of adoring angels into a world that would reject Him. What downward stoop He made! But bless the Lord with all our soul that 'He came from God'; because this tells us that it was God Himself who parted with His Beloved for a season. And because He came from God we ought to hold on to His every word, treasure every account of Him, and hold Him in the highest esteem humanly possible. The Bible tells us that He came from God and He would be going to go back to God once He finished all that the Father had given for Him to do. What a mighty work was that indeed! No one else did what He did. No one else was able! The biggest dilemma mankind has ever faced has been dealt with completely by the One who God sent. There on the cross the sweet unbroken fellowship He had always enjoyed with His Father was broken on account of the fact that He was made sin. There He bore in His own body the eternal wrath of a holy God against sin in its entirety once for all. All that He willingly left behind deserted Him when in those dark hours He suffered, bled and died alone! Where would we be without the knowledge that His suffering is over now. He now lives in the power of a endless life beck in the presence of all He left behind when He came from God over two thousand years ago. We owe Him so much for the love He demonstrated towards unworthy folks as ourselves. "Love so amazing, so divine, demands my heart, my life, my all." Isaac Watts. I would like to take this opportunity to wish all our visitors a very Happy Christmas and every blessing for 2014. Remember this is the year in which our beloved Lord could be coming again. The question is ... are you ready? and gave himself for me." We visit an elderly friend from our church family regularly and more often than not it takes a little while for her to register who we are. Unfortunately she suffers from Alzheimer's disease and is being cared for in a nursing home. She has been moved recently to another nursing facility where she will be for the rest of her life. When we caught up with her, there she was freshly bathed, cuddled up under a warm blanket sporting her shoulder length fluffy white hair. She looked a picture of contentment. I drew a seat closer to her and prepared to listen to her 'story telling' once again but I found this time she was very sleepy and our visit was going to be very brief. My heart was warmed at her comments as she struggled to stay awake. This day her mind wasn't drifting but was firmly focused on her beloved Lord Jesus and what He means to her. Earlier in her life she had been quite a scholar and knew in-depth meanings to Bible words and phrases I was not so familiar with. After a little while and the usual exchange of greetings and asking how everybody there was a small silent moment when she seemed to be reflecting. "Did you know", she said to me, "I was telling somebody today about what Jesus did on the cross, and she didn't understand what I meant when I told her that He died on the cross 'in your place'!" "What place?" the woman said to me, "when you said He died in my place, I want to know - what place?" "Aah, then I remember," my elderly friend continued, "then I remember that the actual real rendering of this phrase is: He died - 'instead of me'!" She savoured the words as she repeated them softly over and over again: "He died - instead of me, instead of me, instead - of - me." It was time for me to leave. I brushed back her hair and softly planted a kiss on her forehead and she opened her sleepy eyes and smiled, then drifted off to sleep. Reflecting on those precious moments with our friend I couldn't help but feel touched at the simplicity and sweetness of it all. There she is at the twilight of her life, and everything that might have seemed so important sometime earlier has all been brushed aside. A simple statement was all she needed to give her the sweet assurance that all is well with her soul. I felt so thankful; for others in the home where she was being cared for were not so content and peaceful. Their minds were troubling them and some were locked in fear with seemingly no means of escape. This could have been the demise or my friend but not so with her; for she was focused on all that really matters at any time of life, let alone at the end of life's journey. I wonder what is your focus. What is the most important thing to you. If you are spared and you get to live well into old age like my friend has who is now in her nineties what will you be thinking about. Will you then be ready to leave this life behind? Will you then be ready for eternity? What will be the most important thing to you then? Seeing as none of us are promised tomorrow, surely it is all important for you to make sure that all is well with your soul now and being ready for eternity now would govern all the rest of your life. If you are ready to meet with God now, then you are ready to live life to the full. And a full life is one that God has planned, full of depth and joy! That simple statement reminds me of a man who lived two thousand years ago. Barabbas was his name. Unfortunately he was a criminal and was on 'death row' as it were. It was the custom for the Romans who were rulers of that day to crucify malefactors and the day for his demise was fast approaching. What must have been going through his mind as the day drew near? He probably didn't sleep the night before the appointed day and not long after the sun arose there came the sound of approaching footsteps. The prison guard was coming to take him to his death! But wait, something is different! The dungeon door is flung open and for a moment of time Barabbas is blinded by the morning light. The silhouetted figure of the guard stands before him with a message he doesn't understand: "Barabbas, you're free to go." The guard gestures to the prisoner and tells him to: "Come and follow me and I'll show you." He follows the guard out from his cell and into the day light. The guard points to three crosses situated outside the city walls where three men have just been impaled. Two of them he can just about recognise as his fellow companions in crime but the man on the centre cross he is not familiar with. "See? Someone is dying instead of you, now you are a free man! What is must have meant to Barabbas to see that Jesus was dying in his place we will never know but this perfectly demonstrates the essence of the Gospel message. That is we are guilty sinners but Jesus died in our place. I wonder how many reading this can honestly say in all sincerity "I am a guilty sinner but Jesus died for me!" To treasure this truth within the depths of your heart will be the all important factor for all the days of your life and for the endless ages yet to come. Jesus died 'instead - of - me'! Having made several attempts to write this latest blog for a number of weeks I got there at last :-) The nature of the distractions that have occurred since my last entry have certainly filled up my time, and I can't believe how quickly the time has passed. I trust that the following thoughts will be of a blessing to you especially if at this time you are one of those people who may be feeling unloved and forgotten. Having moved from our temporary accommodation and settled in to our new home we have over the months passed tidied our garden and fashioned it to accommodate a winding slab pathway leading to a small shed at the far end. A few little dug out gardens around the edge are now home to cuttings and small bushes which will one day be moved to their more permanent home. Intense dry weather is making the growing of a lawn rather difficult and it needs watering each evening just to keep it going until we get some substantial amount of rain. There is more construction or renovating work being undertaken to the houses that surround us, so we are in effect living right in the middle of a building sight for a while. My husband made a make shift bird feeding table to try and attract the little birds back that have been chased away by all the heavy machinery. Although they do visit our garden, we are still waiting for these little creatures to visit the table. However we do get visitors to our bird table in the form of herring gulls which are usually more native to the sea and coastal areas. These birds have taken to coming inland and there are a few pairs of them nesting on the rooftops of the neighbouring houses. Because the weather has been both hostile to man and beast, these poor birds are rather desperate for sustenance and refreshment and have resorted to eating the tiny seeds that we were leaving for the little birds. Because of this we have had to purchase a birdfeeder to keep the gulls from eating the seeds and frightening the little birds away. They are welcome to drink from the many sources of water there is to be found in our garden but they will have to go further afield to find food. It is a bit of a battle at the moment and as yet we haven't seen much in the way of small birds but we wait with patience for the day when the dear little visitors will frequent our garden more often. "I love sparrows, they're my type of birds!" said my husband to me one day a little while ago as we watched them having dust baths in the dry earth in our dug out gardens. I knew what he meant; for sparrows are not showy birds, in fact they are rather plain, but they don't appear to be at all bothered about that. Most people wouldn't give them a second look, and they don't seem to be bothered about that either, and yet there they are all around us and our Heavenly Father knows about them all. He knows every intricate detail of their little lives and His care for them is rather humbling. Why is that? 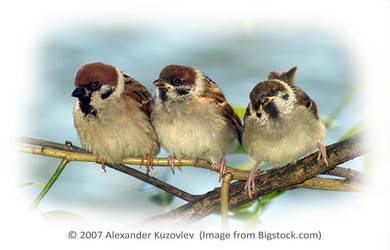 It is simply because the Lord Jesus Himself told us that He who cares for the sparrows cares for us also. Let your heart enjoy the following words. "Are not two sparrows sold for a farthing? and one of them shall not fall on the ground without your Father. Fear ye not therefore, ye are of more value than many sparrows." Perhaps there are times in our lives when we passing through a trial of one sort or another which leaves us feeling as if we are all alone. "What is God doing?" We might be thinking. "Doesn't He know that this is almost unbearable?" "Why is He allowing this and doesn't take it away?" A million thoughts run through our confused minds and we convince ourselves that nobody cares, not even God! Dear suffering soul, God does care for you with the tenderness of a shepherd's care and He who knows and cares about the intricate details of the little sparrows knows and cares all about yours. He never allows a trial to come your way without a purpose. Although we will not necessarily know what that purpose is straight away, there is always something priceless about Himself that we can learn and treasure all our lives. These are treasures we can take with us through our lives, share with others, and take with us when we pass from this life into His presence. So if ever you are feeling as if you are insignificant, or alone, just think of those darling little sparrows and remember the Lord's care for them. He knows what is best for all of us for time and for eternity, so never doubt His love. He proved His love for people like you and me at Calvary: "God commendeth his love toward us, in that, while we were yet sinners, Christ died for us." Romans 5: 8. The same One who died for sinners on the cross now lives in the power of an endless life. You can trust Him implicitly with your life as well as with your soul. Why not do that today? "The Father sent the Son to be the Saviour of the world." Jersey, the largest of the Channel Islands is rather famous worldwide for many things; from our rather pretty dairy cows to Jersey Royal potatoes, from our beautiful scenery, which is an attraction to our visitors, to the new "Man of Steel", born here in our beautiful Island. There has been a lot of excitement over the release of this new film and everyone has been kept in suspense for a number of months. There have been teaser trailers to attract interest in the release of this new Superman movie and images of the new hero almost everywhere I see from the press, TV and social media. And now, at last the movie had its worldwide premier in the USA on the 11th June, and then the next day had its European premier in London on the 12th June and we were privileged to have our own premier here in Jersey as well! Some of the main cast were here for this special occasion like Amy Adams, Russell Crow, and of course the man himself, our very own Henry Cavill. I listened with interest to the comments of those presenting the afternoon show on our local radio. It was being presented live from London at Lester Square where the European film premier of 'Man of Steel' was to take place. All sorts of people were participating from officials to spectators who had waited for hours to catch a glimpse of the stars as they made their way to the cinema where the film was going to be shown for the first time on British soil. I am sure there are many people who have high hopes for this film. Among them of course will be the film's producers and financers who will be looking for a substantial return for this ambitious project. But among those I heard being interviewed were one or two who I believe may be aiming a little too high in their hopes! "This film," they say, "has come at just the right time; for a depression has come upon us in this country and globally, and the "Man of Steel" comes with 'hope', and hope is something we all are in need of right now." There is a clip in the film where Lois Lane asks Kal-El what the 'S' stands for on the front of his outfit. He answers: "It's not an 'S'! In my world it means hope." And she replies: "Well here it's an 'S' - How about 'Superman!" (As she sais the word 'Superman' a kind of static sound interferes and obscures the clarity of what she was saying. Almost as if to emphasise the awesomeness of such a name!) I think that perhaps some people have forgotten that this is only a film and Superman or Man of Steel is only a fictitious character. Although I have no doubt that the film is going to be somewhat of a hit, it must not be anything more than that. I couldn't help but think of a Man I know very well who is God's answer to the needs of humanity. The beloved Son of God came into this scene of time and was born to a virgin maid in a little insignificant little town called Bethlehem 2000 years ago. Very few people understood who he really was and those who should have known better should have welcomed Him with open arms, but instead, they instigated a hate campaign against Him, which eventually saw Him nailed to a Roman cross outside the city walls of Jerusalem where He was left to die. Thank God we have the Bible to tell us that: 'He was delivered by the determinate counsel and foreknowledge of God ..." See Acts 2: 23. Or else we might despair because of the weight of gross injustice hurled against Him. He was a Man with a mission, and that mission was to do the will of His Father. His Father's will was to one day take Him to the cross where He would die as a substitute for us who deserve to be separated from God forever because of our sin. Jesus our Lord and Saviour - Yes, with a capital "S", is our God of hope, and those of us who trust in Him fully know His joy and peace in our lives. See Romans 15: 13. This is a blessed reality because our Saviour is alive today having risen from among the dead three days after He was crucified. The world that is always looking for a super hero, sadly missed the only One who had the answer to poverty, famine, nature and the elements, sickness, and even death! Perhaps they were looking for someone far superior than what He appeared to be. He didn't stand out from the crowd as far as His appearance was concerned, in fact the Bible tells us He was: "as a root out of a dry ground: he hath no form nor comeliness; and when we shall see him, there is no beauty that we should desire him." Isaiah 53: 2. Though no one would have given Him a second look as it were, there was something by far superior about Him than all the notable heroes down through the annals of history. However, when the question was presented by Pilate to the crowd: "What will ye that I do with Christ?" The crowd cried out with one accord: "Crucify Him, crucify Him - we do not want 'this' to reign over us." Well, I guess they got what they asked for when they chose a known criminal instead of the One who could solve all the problems of daily living. And so folks are still looking for someone to look up to; someone to give them hope. Kings and Queens have come and gone without successfully meeting the needs of their subjects. Politicians are voted in and soon after prove to fail at providing the answers to the great needs of our day. Now it seems that some are looking to this film and the character it portrays, to lift them out of the doldrums and give a bit of hope. It won't be too long before they will come back to the real world after living a fantasy for a while and discover that they are all still wanting. Those of us who are God's people have the unspeakable joy, privilege and responsibility of representing Jesus Christ to a world of people who are looking for hope. The wonderful news is that God's Man, the ever living Man, the unchangeable Man is still available to all those who call upon Him in all sincerity. One future day He will put the world to rights but today it is possible to be in the full enjoyment of what Jesus, the beloved Son of the living God can do in the lives of individuals who are prepared to acknowledge their sin, truly repent of it, and fully trust in the only Saviour God has provided to free them of their sin along with all its consequences. Sadly, as in the days when Christ was here on earth folks would have sooner looked somewhere else for hope because they are not prepared to accept who He really was. In the film, Kal-El states something rather interesting and I think it is worth quoting: "My father believed if the world found out who I really was, they would reject me. He was convinced that the world was not ready - what do you think?" Perhaps the character of Superman has been rejected in this latest film, which I may get to see one day, but one thing we do know in reality is that the world was not ready to receive Christ when He came 2000 years ago! However, the question remains to be answered: "What do you think?" Will you trust Him? Will you receive Him? Will you allow Him to bring into your life the hope you have been longing for all of your days? If you do so, you will never be disappointed!